The Hong Kong Film Award Best New Director Tsang Tsui Shan directed Emperor Motion Picture THE LADY IMPROPER (FEI FUN SUK NUI) starred Charlene Choi Cheuk Yin and new Taiwan Best Actor Wu Kang-Jen. Earlier Kang-Jen came to Hong Kong for post production voice work. Ah Sa and Kang-Jen were not only born on the same month in the same year, but also only two days apart! This year, the birthday pair celebrated a very memorable surprise birthday. The team presented a cake to celebrate Kang-Jen's birthday on the 24th! 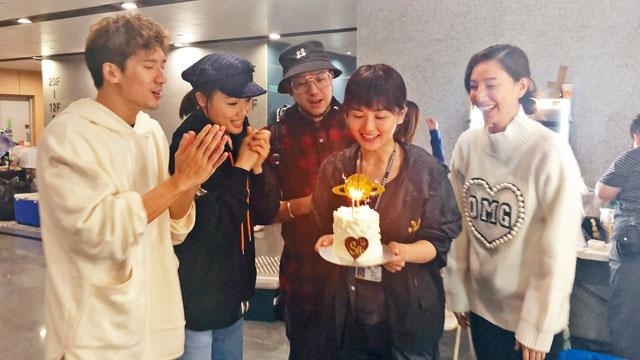 Yesterday, Joey Yung Cho Yi, Yumiko Cheng Hei Yi, Kenny Kwan Chi Bun and Steven Cheung Chi Hung surprised the set with a birthday cake and infinite blessing for Ah Sa! At this time, Ah Sa was busy with the Wai Ka Fai directed COLD DETECTIVE (SUN TAM DAI JIN) wrap scene. Joey and Kenny already visited the set on the 19th. On the 20th Joey and Kenny returned with Yumiko and Steven to celebrate Ah Sa's birthday today. Ah Sa was very happy. "You really are great!" Birthday girl very seriously closed her eyes and made a wish. 4 friends fought to give her kisses. "Even if it's a wig I still want a kiss!" When blowing out the candles, Joey rushed to blow them out for Ah Sa. The birthday girl said, "Then my dream won't come true?" Steven suggested, "If your wish was several million, just ask her for it!" Joey said, "No problem!" 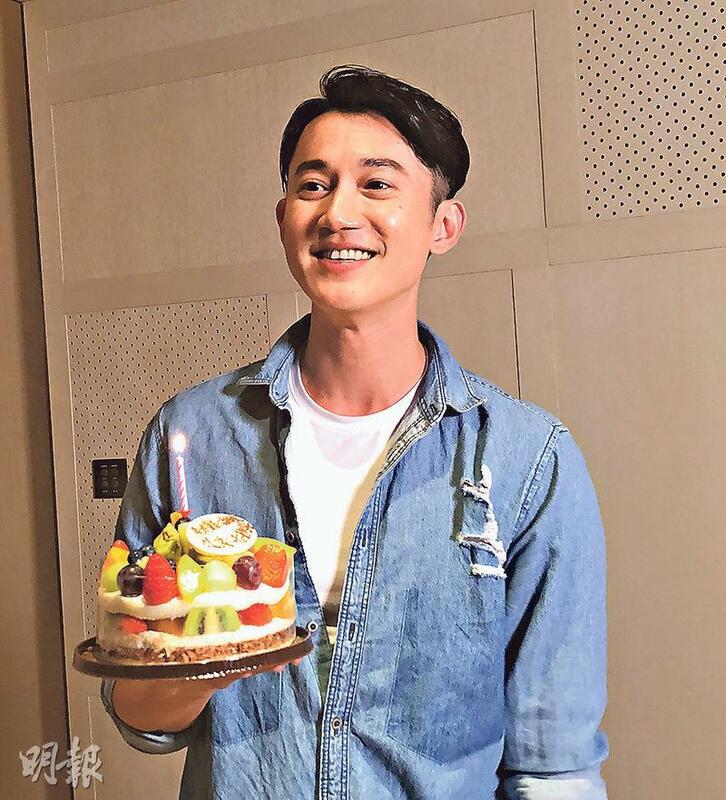 What was Ah Sa's birthday wish? "Good health, happiness, eat, sleep and play, they would already be enough!" Ah Sa used to like planning her life and career, as she grew she understood that plans could not change in time. "Now I am learning to go with the flow. I would take jobs that I am interested in, otherwise I would rest. I wouldn't be too deliberate." From FUNERAL MARCH (SEUNG JOI NGOR SUM) to SARA (CHOR GEI)'s acting explosion 3 years ago, to this year's THE LADY IMPROPER, Ah Sa thanked many directors for giving her different life experience. She has always felt acting was a lot of fun, as she was able to do something that she normally was unable to and live a life that was different from others. Ah Sa in THE LADY IMPROPER ran into Taiwan Best Actor Wu Kang-Jen for the first time and already had wonderful chemical reaction. Ah Sa admired Kang-Jen's persistence, easy to get along with and was willing to learn Cantonese. They then became good friends. Kang-Jen admitted that he fell for Ah Sa. "She is now at her most perfect, very charming. She not only has a good innocent appearance but also self confidence and steadfastness.!"